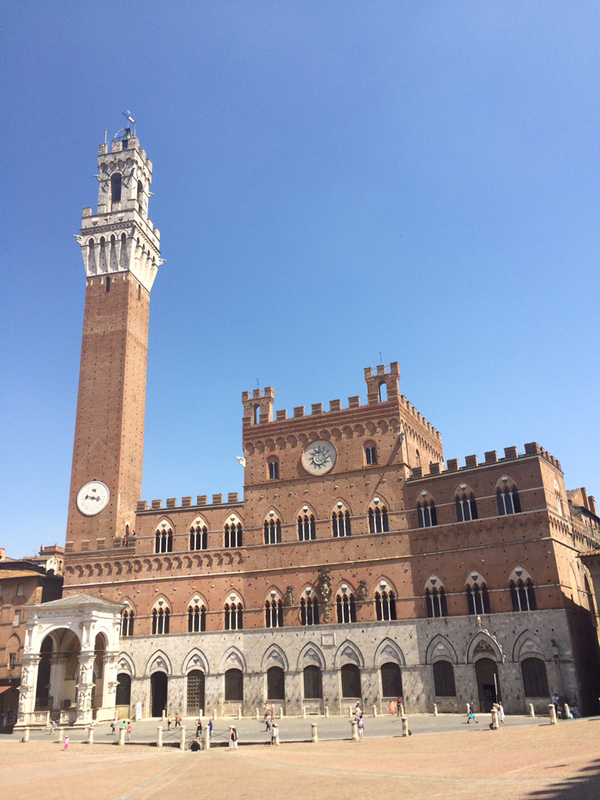 The Palazzo Pubblico has always represented the centre of civic life for the citizens of Siena; it has frequently been at the centre of the most significant events in the history of the city. The construction of the Palazzo Pubblico demonstrated an intense commitment during a relatively short period (1297-1308) that resulted in one of the most elegant and functional buildings of all time, notable for its harmonious, almost symbiotic, relationship with its surroundings. The outside of the structure is an example of Italian medieval architecture with Gothic influences. The lower story is stone; the upper crenelatted stories are made of brick. The facade of the palace is curved slightly inwards (concave) to reflect the outwards curve (convex) of the Piazza del Campo, Siena's central square of which the Palace is the focal point. The campanile or bell tower, Torre del Mangia, was built between 1325 and 1344 with its crown designed by the painter, Lippo Memmi. The tower was designed to be taller than the tower in neighboring rival Florence; at the time it was the tallest structure in Italy. Nearly every major room in the palace contains frescoes. These frescoes are unusual for the time in that they were commissioned by the governing body of the city, rather than by the Church or by a religious fraternity. They are also unusual in that many of them depict secular subjects instead of the religious subjects which are overwhelmingly typical of Italian art of this era. The most famous of the secular frescoes are three panels in the series on government in the Hall of the Nine (also known as Sala della Pace) by Ambrogio Lorenzetti. These frescoes are collectively known as Allegory and Effects of Good and Bad Government. Other notable frescoes include the mysterious fresco of Guidoriccio da Fogliano at the siege of Montemassi, located in the Great Council Hall (Sala del Mappamondo). The Maestà is a fresco (970x763 cm) by Simone Martini. It takes up the whole north wall of the Sala del Mappamondo or Sala del Consiglio in the Palazzo Pubblico. It dates to 1315 and is considered as one of the artist's masterpieces and one of the most important examples of 14th-century Italian art. A few years Duccio painted his Maestà (now in the…), , Simone painted his Maestà for the Palazzo Pubblico as the ideal of the good and just government. This is the oldest painting that can be safely attributed to him. The Sala del Consiglio was constructed between 1304 and 1310, as part of the upper story of the central wing of the building. The first frescoes were executed soon after it was completed. The fresco depicts the enthroned Madonna and Child with angels and saints. This painting, which is signed and dated 1315 but was retouched by Simone himself in 1321, is a free version of Duccio’s Maestà of 1308–11. But the hierarchic structure of Duccio’s work has been replaced by a growing interest in illusionary perspective, and the abstract character and lack of setting of the earlier work has given way to concrete concepts: Simone’s Virgin, crowned and splendidly attired, is a Gothic queen who holds court beneath a Gothic canopy. Surrounded by a frame decorated with twenty medallions depicting the Blessing Christ, the Prophets and the Evangelists and with smaller shields containing the coat-of-arms of Siena, the fresco shows a host of angels, Saints and Apostles, with the Madonna and Child in the centre. The whole scene, set against a deep blue background, is surmounted by an imposing canopy of red silk. Simone Martini was probably apprenticed with Duccio di Buoninsegna (1255-1319), from whom he absorbed the technique of harmonizing colour . He is especially noted for his trecento experiments in using line for decorative purposes to such an extent that his mature works are almost abstract compositions. The most obvious innovations present in Simone's style are his ideas of three-dimensional space. The supporting poles of the canopy are placed in perspective, thus giving a sense of depth to the composition. Under the canopy there is a crowd of thirty people: no more processions of people in parallel rows, but concrete spacial rhythms and animated gestures. Facing the Maestà, Simone Martini painted another masterpiece in 1328, Guidoriccio da Fogliano all'assedio di Montemassi - Guidoriccio da Fogliano at the Siege of Montemassi, or the Equestrian Portrait of Guidoriccio da Fogliano. The fresco of Guidoriccio da Fogliano, depicting the conquest of the castles of Montemassi and Sassoforte in 1328, formed part of a fresco cycle "Castelli" which occupied the upper part of the wall opposite to the Maestà in the Sala del Mappamondo. It is one of the earliest of such commemorative images, and contains a vast panoramic landscape with the tents of the soldiers in the background. The cycle, commemorating the castles conquered by the Sienese, was initiated in 1314 by the representation of the Castle of Giuncarico, it was continued by the Guidoriccio and in 1331 by the Castles of Arcidosso and Piano. The latter were destroyed in 1361 when Lippo Vanni painted the Battles of Valdichiana and Poggio Imperiale. The figures in the niches on both sides are the patron saints of Siena, painted by Sodoma, an excellent Sienese master of the sixteenth century. In the 1970s, the famous fresco, which had always been, considered the greatest example of Martini's artistic excellence, was re-attributed to a much later artist. The controversy that followed this re-attribution, further stimulated by the discovery of a fresco below the Guidoriccio (a very beautiful one, and certainly much older as we can see from the overlapping of the intonaco), turned into an animated diatribe that has not yet been placated. During restoration work in 1979-80 in the Sala del Mappamondo of the Palazzo Pubblico in Siena, a new fresco was discovered below the imposing Guidoriccio da Fogliano by Simone Martini, representing a castle on a hill and two people in the foreground. The attempt to discover the identity of the unknown author of this work has given rise to much controversy among critics. Duccio, Pietro Lorenzetti, Memmo di Filippuccio, Simone Martini were suggested. The fresco, of outstanding executive quality both in skilful choice of descriptive detail and in its overall coherence, was badly damaged by the Mappamondo, a large, revolving, circular painting by Ambrogio Lorenzetti, which was placed on top of it in 1345. 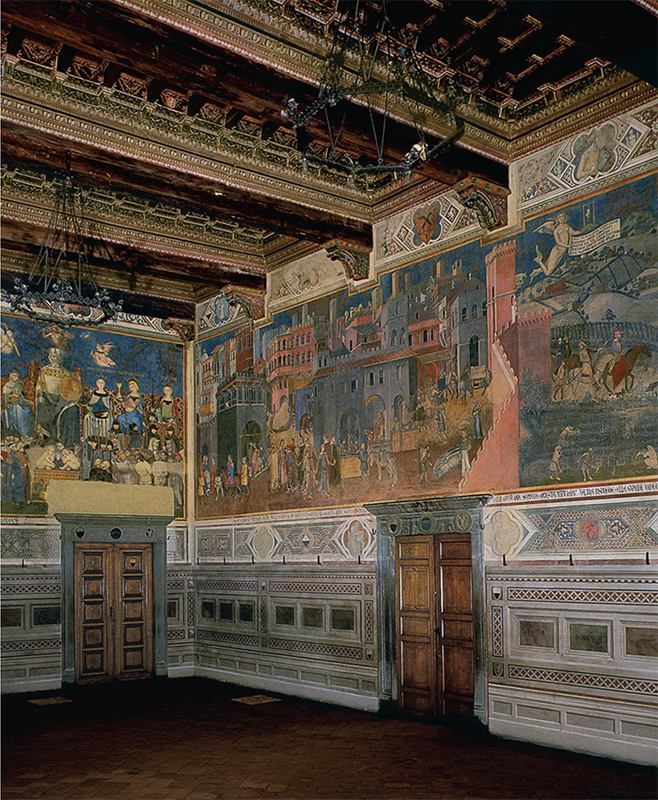 Next to the Sala del Mappamondo is the Sala della Pace or dei Nove, the most noteworthy of the rooms in the Palazzo Pubblico. Here the frescoes depict allegories of Good and Bad Government that were painted by the Sienese painter Ambrogio Lorenzetti between 1337 and 1339. 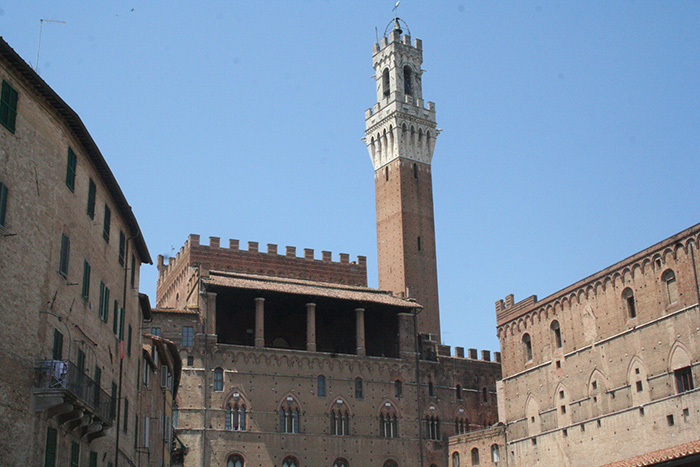 In the picture showing Good Government, you can see a splendid view of Sienna as it was at that time. Ambrogio Lorenzetti's most revolutionary achievement - one of the most remarkable accomplishments of the Renaissance - is the fresco series that lines three walls of the room in the Palazzo Pubblico where Siena's chief magistrates, the Nine, held their meetings (Sala dei Nove). These frescoes are collectively known as Allegory and Effects of Good and Bad Government. The subject of the frescoes are the Good and Bad Government and their effects on the life of the cities and villages. The Allegory of the Good Government is situated on the smaller wall opposite to the windows. The composition is built up from three horizontal bands. In the foreground the figures of contemporary Siena are represented. Behind them, on a stage, there are allegoric figures in two groups, representing the Good Government. The two groups are connected by the procession of the councillors. The upper band indicates the heavenly sphere with the floating bodyless ghosts of the virtues. The enthroned man on the right side of the middle band represents the city of Siena and embodies the Good Government. Around his head the four letters C S C V (Commune Saenorum Civitatis Virginis) explain his identity. At his feet the two plating children are the sons of Remus, Ascius and Senius, the founders of Siena according to the Roman legends. On both sides of Siena the virtues of Good Government are represented by six crowned, stately female figures: Peace, Fortitude and Prudence on the left, Magnanimity, Temperance and Justice on the right. On the far left of the fresco the figure of Justice is repeated as she is balancing the scales held by Wisdom. The allegory carries a strong social message of the value of the stable republican government of Siena. It combines elements of secular life with references to the importance of religion in the city at the time. The figure of Justice resembles the figure of Mary, Queen of Heaven, the patron saint of Siena, on a throne. The Judge reflects the tradition in the Christian Last Judgment to have God or Christ judging the saved on the left; the damned on the right. While classified as medieval or proto (pre)-renaissance art, these paintings show a transition in thought and an evolution in theme from earlier religious art. Flanking the Allegory are two other paintings on perpendicular walls: Effects of Good Government and Effects of Bad Government. Both these frescoes depict a recognizable view of Siena and its countryside. In the allegorical representation of Good Government, the prosperous townspeople are trading and dancing in the streets. Beyond the city walls is a lush countryside in which crops are harvested. In the allegory of Bad Government, crime is rampant and diseased citizens roam a crumbling city. The countryside suffers from drought. 'Lorenzetti is the first painter in the west to be aware of the presence of both the urban and rural landscape, and the formal and compositional characteristics make this masterpiece unique of its kind. As a work entirely of self-representation too, it is, and has remained, unique: the walled city and the agricultural scene are two distinct social and spatial partitions, yet inter-communicating and fully integrated with each other. Man, animals and rural products are shown inside the town walls while the civic nobility goes out to visit the countryside. On the wall opposite the Effect of Good Government and to the left of the Good Government Ambrogio painted another fresco called Bad Government and the Effects of Bad Government on the City Life, which uses the same forms and compositional devices as the other frescoes in the room, but inverts them. The malevolent-looking figure representing Bad Government, pointedly labeled as Tyranny, is enthroned and stares hieratically out at the observer. Neither male nor female, it is fanged, cross-eyed, and porcine, clearly bloated with corruption. In place of the cardinal virtues, personifications of Avarice, Pride, and Vainglory fly over its head. Tyranny is flanked by clearly labeled seated figures representing Cruelty, Treason, and Fraud at the left, and Frenzy, Divisiveness, and War at the right. A bound figure representing Justice lies at its feet. The city to its left is falling into ruin, robbers roam the streets, and, in the foreground, a group of ruffians drags a woman by her hair. Even in its now ruinous condition the image conveys a dire warning. In 1412-14 the Priors of the Palazzo Pubblico commissioned Taddeo di Bartolo to paint a cycle of paintings for the antechapel of the Palazzo Pubblico, a space that functioned as an important passage between other rooms of the palace. On one wall, shown in this picture, Taddeo painted allegories of Justice and Magnanimity under the two arches; beneath each he placed a figure from Roman history exemplifying the concept. Below Justice (at left) there are Cicero, M. Porcius Cato, and P. Scipio Nasica; below Magnanimity (at right) Curius Dentatus, Furius Camillus, and Scipio Africanus. Each group of Roman heroes is labeled with an inscription in Latin, and each figure bears a further Latin Inscription below his feet. The inscriptions between M. Curius Dentatus and F. Furius Camillus claim them as founders of Siena, while others under Cicero and Cato speak of their fight for liberty and justice. Accompanying Simone Martini's Maestà in the Sala del Mappamondo (formerly known as Sala del Consiglio) were a number of secular images. Frescoes commemorated battles and important military captains. One of the best surviving examples of this reportorial art was commissioned from the painter and miniaturist Lippo Vanni to record the Sienese victory in the Val di Chiana over English mercenaries in 1363. His monochromatic fresco records the progress of the battle and the disposition of the troops episodically across the wall; it is a graphic chronicle of the event rather than a naturalistic reconstruction, with cities carefully labeled and the armies identified by the heraldic flags of their leaders. He was a miniaturist, and painted for the Spedale in 1344. In 1352 he executed a Coronation of the Virgin for the Biccherna. In 1359, together with Nello Betti, he executed some work in the Palazzo Pubblico, and in 1372 he painted an Annunciation for the cloisters of San Domenico at Siena, portions of which work still exist. On the walls facing of the windows are the Battaglia della Val di Chiana - Battle of Val di Chiana - a work by Lippo Vanni (1363) and the Battaglia del Poggio Imperiale contro i fiorentini - Battle against the Florentines at Poggio Imperiale - by Giovanni di Cristofano Ghini and Francesco d’Andrea (1480). Below these two paintings is a gallery of Siena’s most venerated saints: San Bernardino by Sano di Pietro, painted the year he was canonised (1450); Santa Caterina by Vecchietta (1460) and the Beato Bernardo Tolomei, founder of the Olivetani, by Sodoma (c.1530). Sano di Pietro, Bernardino and his IHS Monogram Tablet (Sala del Mappamondo, Palazzo Pubblico, Siena). “IHS” is an abbreviation of the Greek form of Jesus’ name). The passageway, known also as the Sala dei Cardinali leads to the Sala del Concistoro, with an internal doorway in marble by Bernardo Rossellino. The brightly coloured frescoes on the ceiling were completed between 1529 and 1535 by Domenico Beccafumi, once more a representation of themes related to justice and patriotic devotion that take their cue from the Lorenzetti Good Government and the di Bartolo Illustrious Men cycles. Domenico Beccafumi (1486 – 1551), born in Montaperti, near Siena, was an Italian Renaissance-Mannerist painter active predominantly in Siena. Originally named Domenico di Pace, and also called Il Mecherino, he took the name Beccafumi from his patron, a wealthy Sienese who sent him to study in Siena and Rome. He is considered one of the last undiluted representatives of the Sienese school of painting, and the most brilliant exponent of Mannerist art in Siena. Domenico Beccafumi was in Rome as a young man, from 1510 to 1512, where he became familiar with the work of Raphael and Michelangelo. Even though he worked in Siena for most of his life, he traveled also to Florence, Genoa (where he encountered the elegant Raphaelesque style of Perin del Vaga), and Pisa (where he painted two canvases in the apse of the cathedral). Beccafumi’s art is characterized by imaginative design and draftsmanship and by subtle atmosphere and the play of light and shadow. Beccafumi designed 35 splendid mosaics from 1517 to 1546 for the pavement in Siena Cathedral, each mosaic depicting a different Old Testament scene. Beccafumi's best-known paintings are the ceiling frescoes of the Palazzo Publico in Siena and an altarpiece in the same building. Most of his best works, such as the Birth of the Virgin (c. 1543) are in Siena. Next to the Sala del Concistoro is the Sala di Balia, also known as Sala dei Priori. This room is adorned with frescoes by Spinello Aretino (1407) illustrating the Life of Pope Alexander III dei Bandinelli. One of the scenes of Roman Justice frescoed on the ceiling of the Sala del Concistoro of the Palazzo Pubblico by Beccafumi between 1529-1535. Art in Tuscany | The Guidoriccio fresco: a new attribution: Thomas de Wesselow argues that the celebrated fresco, traditionally known as Guidoriccio, in Siena's Palazzo Pubblico, is not by Simone Martini, and proposes an alternative candidate. Lavishly illustrated with contemporary depictions and original artwork, this title examines the complex military organization, recruitment, training and weaponry of the Condottieri. With insight into their origins and motivations, the author, Dr David Murphy, brings together the social, political and military history of these powerful and unscrupulous men who managed to influence Italian society and warfare for over two centuries. Inside the valley of Porta Giustizia it is possible to visit the 'medieval garden' L'Orto de'Pecci. The valley of Porta Giustizia, under Piazza del Mercato, is one of the best preserved green areas inside the old Walls of Siena. It has always been an ideal territory tor cultivation: it is watery and plan, beyond the uphill road called Via di Porta Giustizia. The name of the area, "Orto de' Pecci", refers to this function ('orto' means garden) and to the name of the family (the 'Pecci') which had owned the land tor a long time in the past. L’Orto de’ Pecci comprises an exellent restaurant and bar, All'Orto de'Pecci. It is our favorite restaurant in Siena. This fresco is situated below the Guidoriccio and is variously attributed, but convincingly argued to be the real Guidoriccio by Simone. There is evidence of marks around the face and figure, consistent with damage caused by the throwing of pallets. When the fresco was uncovered, the figure was hidden by a cover of blue paint. Guidoriccio was a mercenary soldier, who changed sides in 1333 and fought for the opposition. It appears far more convincing that the citizens of Sienna would show their disapproval in this way, rather than celebrating a portrait in their town hall of a person who had become their enemy and a traitor to them. The grooves are left by the rotation of the Carte Topa grafica installed in the 15th Century. [3b] Meoni, Maria Luisa. 2005. Utopia and Reality in Ambrogio Lorenzetti’s Good Government. Edizioni ITI, Florence, pp. 23-27. 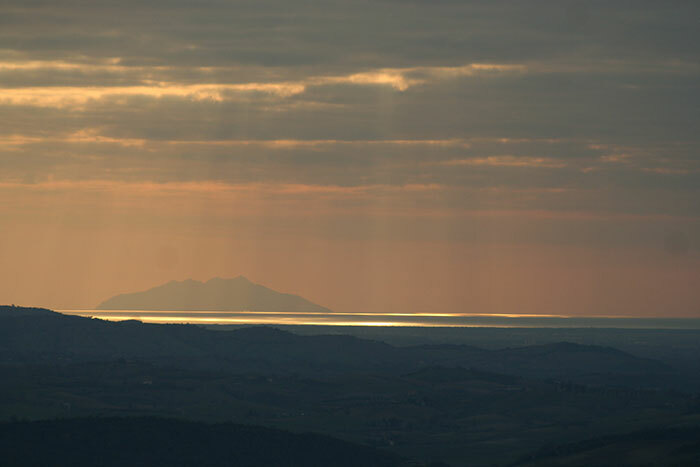 Podere Santa Pia is embedded in the tranquility of the Tuscan country and let you enjoy great views of the Maremma. It is suitably located only 20 kilometers from the highway Grosseto - Siena.